Evotec is partnering with the Harvard Stem Cell Institute (HSCI) to identify compounds that prevent or slow down the loss of motor neurons, which is characteristic of amyotrophic lateral sclerosis (ALS). The collaboration, dubbed "CureMN" (CureMotorNeuron) aims to leverage human motor neuron assays based on ALS patient-derived induced pluripotent stem (iPS) cells as well as Evotec's drug discovery infrastructure and expertise to identify compounds that will have therapeutic value against the disease that Lou Gehrig made famous. The iPS cells in question were developed by Lee Rubin, Ph.D., HSCI principal faculty member and professor in the department of stem cell and regenerative biology at Harvard, and Kevin Eggan, Ph.D., early career scientist at the Howard Hughes Medical Institute, HSCI principal faculty member, and professor in the department of stem cell and regenerative biology at Harvard. "Kevin and Lee have made significant contributions to our understanding of the underlying pathology of motor neuron diseases," said Cord Dohrmann, Ph.D., CSO of Evotec, in a statement. "Their laboratories have developed a large array of ALS patient-derived motor neuron models that allow screening of diseased human cells in culture-;an approach that is sometimes referred to as a 'clinical trial in a dish'. Our intention is to systematically screen for new mechanisms, targets, and compounds that have the potential to be developed into new products that will modify and ideally halt the progression of ALS and potentially other motor neuron diseases." This agreement marks the third collaboration between Evotec and Harvard Stem Cell Institute scientists, and the fourth with Harvard scientists. Back in March of 2011, Evotec and Harvard forged a beta cell regeneration alliance dubbed CureBeta, and in January of 2012 they started the CureNephron project with Brigham and Women's Hospital aimed at discovering and developing biomarkers and treatments for kidney disease. Also, in May of this year, Evotec and Harvard teamed up to discover and develop novel antibacterial agents based on a target family involved in bacterial cell wall biosynthesis that reportedly are highly validated. This article was reprinted from Genetic Engineering & Biotechnology News (GEN) with permission from Mary Ann Liebert, Inc., publishers. Genetic Engineering & Biotechnology News (GEN) has retained its position as the number one biotech publisher around the globe since its launch in 1981. GEN publishes a print edition 21 times a year and has additional exclusive editorial content online, like news and analysis as well as blogs, podcasts, webinars, polls, videos, and application notes. 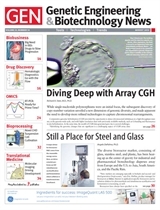 GEN's unique news and technology focus includes the entire bioproduct life cycle from early-stage R&D, to applied research including omics, biomarkers, as well as diagnostics, to bioprocessing and commercialization.